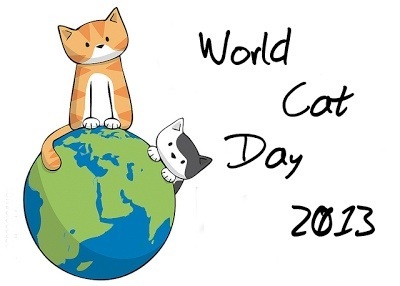 August 8, 2013 – A most auspicious and impawtent day of da year, World Cat Day is here. On dis day felines all over da earth are honored and held in most highest esteem by anipals and hoomans. To all our kitteh furiends, we salute you and shower you wif hugs n kisses. This entry was posted on Thursday, August 8th, 2013 at 2:03 am and is filed under Feline Lifestyle, Meowsings, News. You can follow any responses to this entry through the RSS 2.0 feed. You can leave a response, or trackback from your own site.